How Laser Printers Work – Laserlite Inc.
Have you ever wondered how an electronic image displayed on your computer screen is copied near perfectly onto a piece of paper within a matter of minutes? (Sometimes within a matter of seconds!) How does this miracle happen? How do laser printers actually work? 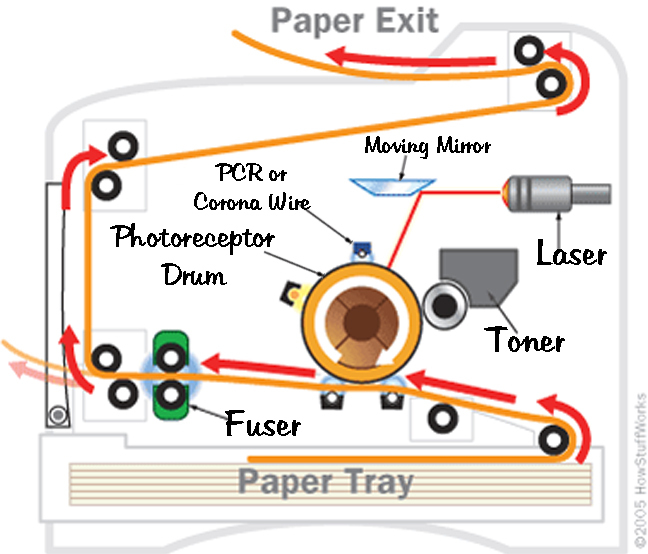 Step 1) Electronic data from the computer is sent to an electronic circuit inside the laser printer. There, the data is deciphered into what will become an image on a sheet of paper. Step 2) An electronic circuit activates a corona wire or a PCR (primary charge roller) next to a cylindrical photoreceptor drum. If your printer uses a corona wire, it gives a positive (+) initial charge to the surface of the drum. If your printer uses a PCR, it gives a negative (-) initial charge to the surface of the drum. Step 3) Meanwhile, the electronic circuit activates a laser beam which bounces off a moving mirror to essentially ‘draw’ an image onto the drum’s surface. This is done by the laser beam hitting the drum, erasing the existing charge in spots and creating the opposite charge in those same spots where toner will eventually cling. Areas on the drum meant to remain white on the paper keep their initial charge. Step 4) A developer roller or ink roller that is in contact with the drum, coats the drum with toner (powdered ink). 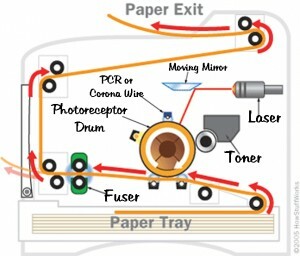 The toner holds a charge that is opposite to the charge of the image on the drum; therefore, the toner clings to the areas on the drum altered by the laser beam. This results in a toner image created on the drum. Step 5) When a sheet of paper passes near the drum, the charge on the paper attracts the toner particles clinging to the drum. (Again, opposite charges attract.) The image is transferred from the drum to the paper, but the toner merely clings or ‘rests’ on the page at this point. Step 6) Lastly, the page passes through a fuser unit, a pair of very hot rollers. Heat and pressure from these rollers fuse the toner image permanently onto the page. And viola! A final printout exits the printer!